The Thailand Buddhist Monks have both a beautiful and ugly tradition of collecting gifts, maybe called alms in each morning from followers. I am in Ranong, Thailand and was lucky enough today to make a video of Thailand Buddhist Monks collecting alms in the morning. 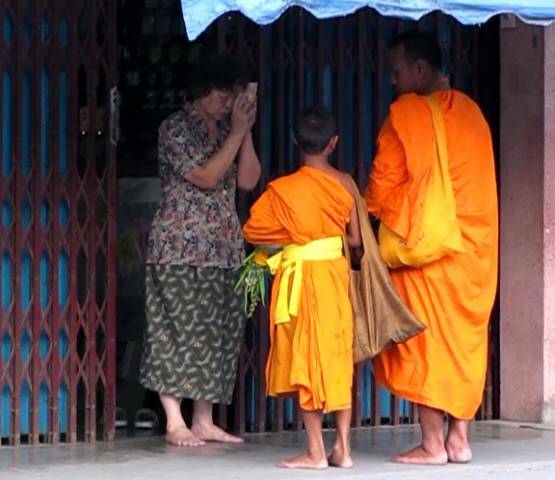 Each day the Thai Monks walk around in villages and cities of Thailand collecting gifts from people. In a way, this is the about same as if the USA Christian ministers would walk town passing around the collection plate daily to their followers. I watch this with a sense of holiness, it feels like I am on the way to Sunday school in my small midwestern town of Orland. If feels like something good, a reverance for something greater than ourselves. I also look at the powerful manipulative powers of world religions to keep people in check, to control their lives. Each day, the Thailand people are forced to witness they believe, and to pay, it is about the same as if a Christian Minister cames to your house daily and put a collection plate in front of you. What would you do, would you feel grateful, or would you feel sort of guilty? Each day the Buddhist Monks get to take tally, who is good, and who is bad, who is a good Buddhist? I was in Llassa, Tibet, and they worshippers prostate themselves for miles, slowly standing, then lying down, working their way to the Potala Palace. "My friend is just like a Monk." "She does not appear very holy to me?" "I do not understand, what do you mean?" "A Monk always believes he should sit in the front of the truck, while the rest of us sit in the back." I do not feel anything good for the Dali Lama of Tibet, I have been to Tibet, and the Chinese made it better for the small people. I am 100 percent in favor of Religions, the alternatives to having religions is a rather ghastly life, more or less, there are no athesists in foxholes.